Have you ever "googled" yourself? Of course you have. And what did you find? Chances are as you may be either looking for a church/pastoral position or hiring for one, you've turned to google. But what are the challenges and potential problems for both the potential candidate and the search committee? In the Call and Response blog from Duke Divinity school, Carol Howard Merritt discusses the issue of search committees and Google. This experience has made me wonder: what happens if someone on a search committee Googles the name of a candidate who has been attacked by a vicious blogger? How much will that weigh on the committee’s decision? We can usually control what sort of information we put on the Internet about ourselves, but we cannot control what people say about us. We also have very little legal recourse in these situations (to dig deeper, see Daniel Solove). 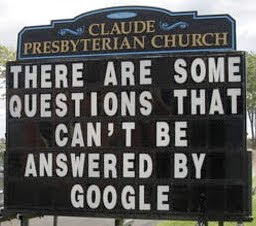 How do we lead religious institutions in the Google generation? There are a few possibilities. First, religious leaders can severely limit their web interactions. Some people have decided that it is too dangerous for one’s reputation to get in the mud of social media. If they do interact, then it’s all business. I respect this decision, but I also think that social media presents incredible opportunities for us to connect with people in authentic and creative ways. I would hate to miss out on that because I’m a pastor. In fact, it seems that I should be involved because I’m a pastor. Second, we can encourage no-Google policies in our job searches. This is something that Daniel Solove condones, but I’m afraid it is not possible. When an employer is trying to gain as much information about a candidate’s character as possible, then I’m not sure that they can ignore such an important research tool. And even if the search committee did maintain a no-Google policy, the people in the institution or pew will be looking up the name on search engines.